Material type: BookPublisher: Boston : Houghton Mifflin, c1968Description: 26 p. : col. ill. ; 24 cm.ISBN: 0395539633.Subject(s): Folklore -- AfricaDDC classification: 398.2 Awards: Caldecott Medal/HonorSummary: An African folktale tells how the sun and water once lived on earth as friends, but because the sun failed to build his house large enough, he and his wife, the moon, were driven into the sky when the water came to visit them. First published in 1914 in the author's Folk stories from southern Nigeria, West Africa. 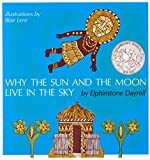 An African folktale tells how the sun and water once lived on earth as friends, but because the sun failed to build his house large enough, he and his wife, the moon, were driven into the sky when the water came to visit them.